On December 7th, Brocade publicly announced the latest addition to their campus LAN Ethernet switching portfolio, the Brocade ICX 7150. The ICX 7150 is an entry-level campus switch with an entry-level price point to match. The ICX 7150 fills a gap at the lower end of the price / performance spectrum for Brocade and allows Brocade to offer their products to a larger number of customers and for a broader spectrum of use cases. The built in and field upgradeable 4 ports of 10 Gig, the ability to stack up to 8 units in a single stack with 320 Gigs of aggregated stacking bandwidth, and full PoE on all ports offers an enterprise feature set for what promises to be an extremely competitive price. The ICX 7150 is available in three port density configurations: 12, 24 and 48 port 10/100/1000 models with 1 Gig / 10 Gig stacking or uplink ports. It also offers both PoE and PoE+ for customers looking to power Ruckus APs, VoIP phones, surveillance equipment or other network devices. The ICX 7150-C12P is especially interesting. This compact, 12 port switch, offers PoE on all ports. In addition, it is fanless, which opens up many use cases in noise sensitive environments like classrooms, retails stores and small offices. The ICX 7150-C12P promises to quickly become one of Brocade’s highest selling products. 1 Support to be available in a future software release. The Brocade ICX 7150 is easy to deploy, manage, and integrate into both new and existing networks. Organizations can buy only what they need today, and easily scale out as demand grows and new technologies emerge. Brocade Ethernet switch stacking2 technology makes it possible to stack up to eight Brocade ICX 7150 switches into a single logical switch. This allows the Brocade ICX 7150 to deliver a class-leading 320 Gbps of aggregated stacking bandwidth and offer simple and robust expandability for future growth at the network edge. 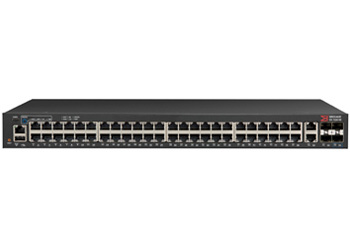 This stacked switch simplifies management with only a single IP address and offers transparent forwarding across a pool of up to 400×1 GbE ports and 32×10 GbE ports. When new switches join the stack, they automatically inherit the stack’s existing configuration file, enabling true plug-and-play network expansion. Flexible licensing of 1 GbE to 10 GbE ports for uplink and stacking allows organizations to optimize network performance based on specific requirements. Brocade stacking technology also delivers high availability, enabling instantaneous hitless failover to a standby stack controller if the master stack controller fails. In addition, organizations can use hot-insertion and removal of stack members to avoid interrupting network services. Software-Defined Networking (SDN) is a powerful new network paradigm designed for the world’s most demanding networking environments and promises breakthrough levels of customization, scale, and efficiency. The Brocade ICX 7150 enables SDN by supporting the OpenFlow 1.3 protocol, which allows communication between an OpenFlow controller and an OpenFlow-enabled switch. Using this approach, organizations can control their networks programmatically, transforming the network into a platform for innovation through new network applications and services. The Brocade ICX 7150 delivers OpenFlow in true hybrid port mode, which allows organizations to simultaneously deploy traditional Layer 2/3 forwarding with OpenFlow on the same port. This unique capability provides a pragmatic path to SDN by enabling network administrators to progressively integrate OpenFlow into existing networks, giving them the programmatic control offered by SDN for specific flows while the remaining traffic is forwarded as before. Brocade ICX 7150 hardware support for OpenFlow enables organizations to apply these capabilities at line rate. Brocade ICX Switches support the IEEE 802.1AB Link Layer Discovery Protocol (LLDP) and ANSI TIA 1057 Link Layer Discovery Protocol-Media Endpoint Discovery (LLDP-MED) standards that enable organizations to deploy interoperable multivendor solutions for Unified Communications (UC). Configuring IP endpoints such as VoIP phones can be a complex task, requiring manual and time-consuming configuration. LLDP and LLDP-MED provide a standard, open method for configuring, discovering, and managing network infrastructure. The LLDP protocols also reduce operational costs by simplifying and automating network operations. For example, LLDP-MED provides an open protocol for configuring Quality of Service (QoS), security policies, Virtual LAN (VLAN) assignments, PoE power levels, and service priorities. The Brocade ICX 7150-24, the Brocade ICX 7150-48, and the Brocade ICX 7150-C12P compact switch feature a fanless design that enables them to operate silently. The Brocade ICX 7150-24P and the Brocade ICX 7150-48P offer a “fanless mode” configuration option, enabling these switches to operate with the fan disabled while providing a PoE budget of 150 watts. This Brocade-exclusive feature enables the Brocade ICX 7150 Switches to be deployed outside of the wiring closet without disrupting the environment. This capability is critical for organizations such as hospitality, education, healthcare, and retail where networking equipment needs to be deployed into a work environment or living space such a classroom, hotel room, patient room, operating room, or retail space with minimal disruption. When every second matters, the Brocade ICX 7150 Switches help deliver continuous availability to optimize the user experience. Brocade stacking technology delivers high availability, performing real-time state synchronization across the stack and enabling instantaneous hitless failover to a standby controller in the unlikely event of a failure of the master stack controller. Organizations also can use hot-insertion/removal of stack members to avoid interrupting service when adding a switch to increase the capacity of a stack or replacing a switch that needs servicing. In addition to stack-level high availability, Brocade ICX 7150 Switches also support stack level ISSU3 (In Service Software Upgrade), a unique capability that enables a Brocade ICX 7150 stack to go through a software upgrade without service interruption. All Brocade ICX 7150 Switches come with basic Layer 3 support3 including static routing and RIP. An upgrade license can be acquired to bring premium Layer 3 capabilities to the network edge, reducing complexity and enhancing the reliability of enterprise networks. To reduce complexity and the time spent managing these environments, the easy-to-use Brocade Network Advisor discovers, manages, and deploys configurations to groups of IP devices. By using Brocade Network Advisor, organizations can configure Virtual LANs (VLANs) within the network, manage wireless access points, and execute commands on specific IP devices or groups of IP devices. sFlow-based proactive monitoring is ideal for performing network-wide troubleshooting, generating traffic reports, and gaining visibility into network activity from the edge to the core. Brocade Network Advisor centralizes management of the entire family of Brocade wired and wireless products.